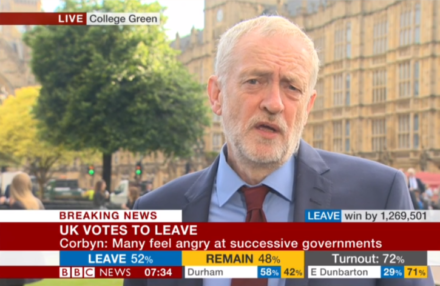 Jeremy Corbyn has said Article 50 must be invoked immediately and that a Leave vote prevailed because of anger against marginalisation and austerity. He said the result of the poll means the exit clause – Article 50, which would give a two year period for Britain to leave – must be observed as soon as possible in an interview with the BBC. “The British people have made their decision. We must respect that result and Article 50 has to be invoked now so that we negotiate an exit from European Union. “Obviously there has to be strategy but the whole point of the referendum was that the public would be asked their opinion. They’ve given their opinion. It is up for parliament to now act on that opinion. “Quite clearly negotiations must take place. There must be the best deal possible in order to ensure strong industries in Britain stay strong and strong industries that have big export markets protect retain those export markets. But we are in some very difficult areas. That’s obvious to everybody. He went on to say he thought the Leave result was the outcome of instability and deprivation many communities have experienced under austerity, saying the choice was the reaction against Governments that have ignored them. He went to warn that Brexit could threaten stability and hit jobs in the UK. “I think a lot of the the message that’s come back from this is that many communities are fed up with cuts they’ve had, fed up with economic dislocation and feel very angry at the way they’ve been betrayed and marginalised by successive governments in very poor areas of the country. “My point throughout the campaign was we must have an alternative to austerity, we has to have more resources going into areas that have seen huge changes. “We now have to try to protect the working conditions we have in the country between densely populated urban areas and the rest of the country. And to ensure obviously there are some trade opportunities for Britain because clearly there are some very difficult days ahead. The Labour leader also defended his performance during the referendum campaign, saying his “seven and a half” levels of support for the bloc reflected the views of the electorate. It is expected Corbyn will defend his participation in the Labour In campaign over the coming days following criticism his approach was too lacklustre.